Royal Platinum Wedding Bear by Steiff. This beautiful hand made piece, in grey mohair, wears the white ear tag, signifying this item as a Steiff limited edition, together with a Crystal Button in Ear. Limited edition of only 1947 pieces UK. 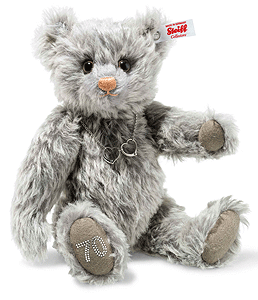 Commemorating 70 years of marriage, the Teddy Bears right paw, has the number 70 outlined in tiny crystals. THE ROYAL PLATINUM WEDDING BEAR Elizabeth first met Prince Philip of Greece and Denmark in 1934, at the wedding of Philip's cousin Princess Marina of Greece and Denmark to Prince George, Duke of Kent, paternal uncle of Elizabeth. They met again in 1937. After another meeting at the Royal Naval College in Dartmouth in July 1939, Elizabeth—though only 13 years old—fell in love with Philip and they began to exchange letters. An entry in Chips Channon's diary made reference to the future marriage of Elizabeth and Philip as early as 1941, "He is to be our Prince Consort, and that is why he is serving in our Navy." The couple became secretly engaged in 1946, when Philip asked King George VI for his daughter's hand in marriage. The King granted his request providing any formal engagement was delayed until Elizabeth's 21st birthday the following April. Their engagement was officially announced on 9 July 1947. Elizabeth, then still a Princess, married Philip Duke of Edinburgh at Westminster Abbey at 11:30 GMT on 20 November 1947. Please join Steiff in congratulating the Royal couple for seventy years of marriage, a truly platinum achievement. Celebrate this great occasion with our stunning commemorative bear.